Paul’s first letter to the Corinthians, one of the earliest Christian writings, had enormous influence on the formation of Christian teaching. In this Church’s Bible volume Judith L. Kovacs weaves comments from all the commentaries and sermon series written in Latin or Greek between the years 250 and 800, illustrating the historic Christian understanding of this crucial text. The church fathers gathered here include Augustine of Hippo, Irenaeus, Gregory of Nyssa, Athanasius, Origen, John Chrysostom, and many more. 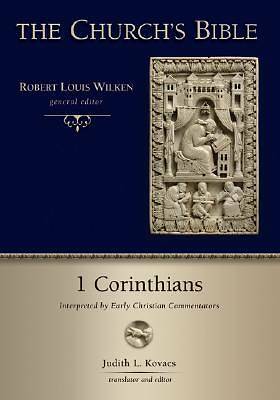 Preceding the line-by-line exegesis are a lucid essay by Robert Louis Wilken on how the church fathers interpreted the New Testament, an informative introduction to 1 Corinthians by Kovacs, and two chapters of general patristic commentary on Paul and on this letter. Completing the volume are several helpful appendixes and indexes. Freshly translating many passages into idiomatic English for the first time, Kovacs does not merely excerpt random quotes from the church fathers but instead produces a sustained interaction with their direct comments on 1 Corinthians. This soaking in the wisdom of the past is sure to spiritually refresh and intellectually sharpen contemporary readers who seek to better understand this part of Scripture.